Model Name: Cosmograph "Fuerza Aérea del Perú"
Throughout the 1960s and 1970s, Rolex received a number of orders for issued timepieces. These tool watches were often delivered to the military and displayed certain modified specifications. 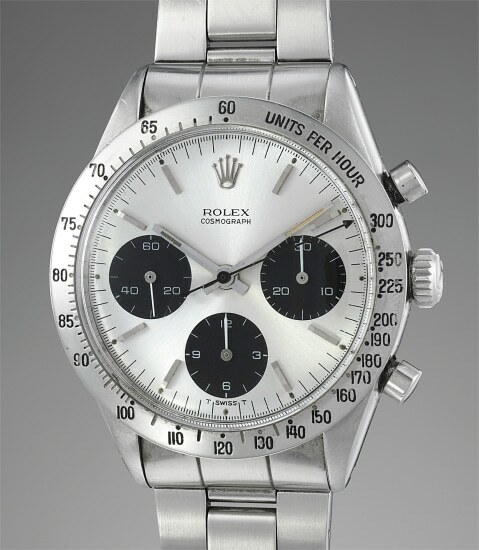 The Peruvian Air Force ordered a number of Daytona watches during this period for high ranking members of the military. Having resided in a private collection for many years, this reference 6239 is one such special issued watch. The caseback is engraved "Fuerza Aérea del Perú". There is a small hole on the outer case back, near the ‘teeth’. This hole was used to secure the case back while Rolex stamped the markings. Most importantly, the inside case back is stamped with the last three digits of the serial number, which was a military specification. This timepiece is preserved in overall excellent condition with crisp finishes to the top of the lugs and overall robust proportions.